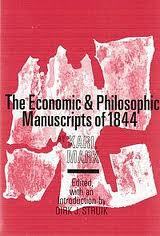 Right now I am working on a lecture for an Introduction to Philosophy course on The Communist Manifesto. Although this exercise is reminding me of how much I hate Power Point (there are several hundred students in the class, and now these slide shows have become normative), I am also excited at the prospect of teaching Marxism through the Manifesto instead of, as is usually the case in philosophy, the essay on "alienated labour" in The 1844 Economic and Philosophic Manuscripts. This is the copy I've owned since the days of my undergraduate degree. Last semester, in a course entitled "The Meaning of Life", I was again teaching that essay on "alienated labour" and the strength of Althusser's argument regarding the young Marx was emphasized in a rather stark manner. For years I have struggled with this argument about an "epistemic break" between the young and older Marx but is only recently, after returning to Althusser to work on certain problems regarding the philosophy of marxism, that I have started to realize that he is generally correct. This realization was brought home in a class discussion where I decided to not provide any introduction to the text and thus bias students with the marxist categories I would otherwise impose. It was interesting to hear their interpretations, based only on what was in the essay itself, and discover that in many ways they proved Althusser correct. Without biasing my students in the reading by intervening with marxist concepts, it did not take me long to discover that, without this intervention of "mature" Marxist theory, the essay on "alienated labour" often read like speculative hippy nonsense. This is not to say that students who have never had the privilege of encountering certain schools of theory aren't often wrong in their interpretation; the problem I witnessed was not the problem of misinterpretation. Rather, as the discussion continued with questions I designed based only on the text and nothing from Marx's later works, I began to feel as if the text itself produced this non-Marxist reading. There was really nothing in it, beyond what I could import from later Marxist texts, that was more than some vague humanist radicalism. Take, for example, his concept of species being upon which the entire essay pivots philosophically. Now if I was to read it in light of the mature Marx, I would bring in the passage from the introduction of the Grundrisse where he defines the human species in a modern materialist version of Aristotle's formulation [zo'on politikon, social animal] or maybe even the passage in The 18th Brumaire of Louis Bonaparte about humans making history while simultaneously being made by history. (As a side note, because of these important definitions, which I think are necessary for Marx's science, I also disagree with Althusser's disavowal of the human subject, but that is a tangental.) And yet, if we abide only by what Marx writes in that essay it is rather difficult to imagine that he had this understanding of what it means to be human. Indeed, his definition is more speculative than idealist: "free, conscious activity"––to make this mean "social/historical animal" and what that concept implies in the later works of Marx is a significant act of backwards engineering. By itself, it is truly a vague and speculative concept. Indeed, there is really nothing materialist in these essays of the young Marx, and my students were under the impression that, without recourse to anything else, that he was telling them that capitalism was bad because it made them feel alienated from themselves and others. And while it is true that capitalism does produce, in a materialist sense, a level of alienation, if we only went by the young Marx we would have to conclude that capitalism was wrong because it makes us feel a level of terrible angst, that it is a bad conscience, that it stops us from pursuing our "free, conscious activity" man! Of course, since I treat any discussion of Marx as an invitation to talk about Marxist theory in general, I eventually introduced the concepts gleaned from the later Marx into the conversation. Bringing this hermeneutics half-way into the discussion, however, produced another problem: the students found it extremely difficult, after discussing only what was in the text itself (and let us be honest, there is nothing in the other essays of the 1844 Manuscripts that would give them a different understanding), to square what was in "alienated labour" with class struggle, modes of production, even the more mature understanding of "species being"––they could not see, without an initial intervention, how this text communicated to these concepts. I was forced to realize that if all Marx had produced were essays such as "Estranged Labour" then he wouldn't have much to say. An important philosophical problematic that this exercise caused me to recognize was precisely what Althusser had recognized and elaborated––something I had resisted for too long but that I should have understood as extremely important for the philosophy of marxism: the distinction, as noted above, between name and concept. That is, just because two things share the same name in a given language does not make them the same concept. This distinction is important, probably the most important distinction for people engaged in the business of philosophically investigating the often confusing geography of marxism, not to mention the business of all philosophical investigations. If we were to assume, for example, that the name "atom" was synonymous with the concept attached to that name as it appears in modern particle physics, then we would have to conclude that Leucippus, Democritus, and Epicurus were modern physicists simply because they argued that all of reality was reducible to atoms. Here's a relevant example for marxist theory, one connected to a recent exchange I had on an old blog entry: if we were to assume that Gramsci's concept of hegemony was reducible to its name, then we would have to conclude that it could be explained by recourse to the ancient Greek root word, hegemon, which means ruler… But in this sense, hegemony would simply mean rulership and this is not what Gramsci meant when he adapted that word, through an Italian history that included Machiavelli, in order to theorize something important about ideology. Most importantly for me, however, is the distinction between the name and current concept of "maoism", a distinction that I have often made without proper elaboration. For when I speak of maoism I am not speaking of everything that called itself "maoism" up until the mid-1980s; I am speaking of the founding of a concept that meant more than the previous articulation of its name. And yet, those who do not understand this distinction––mainly because I never took the time to explain it properly––have often been under the impression that I am being intentionally ignorant to the fact that there were people and organizations who used the term "maoist" to identify themselves before 1988 and 1994. So the distinction between names and concepts is important and, if anything, examining the 1844 Manuscripts in this light has taught me to notice this distinction and realize that it should be part of what I claim to do as a marxist who was trained in philosophy. Maybe it is the only thing worthwhile that I can do as a "philosopher"––which seems somewhat tragic––but I should at least strive to do it well. In any case, this is why I am extremely happy (despite the fact that Power Point is bloody annoying, reminding me yet again why I prefer small classrooms to lecture halls) to be lecturing on the Manifesto instead of something from the 1844 Manuscripts in a philosophy class. Although I'm certain I will make some of the students cringe with horror at the thought of communism, at least that is better than trying to prevent them from falling into the abyss of speculative confusion. I think you're absolutely right about the whole name/concept idea. Just anecdotally, as I've become increasingly aware of the various strands and currents of leftist thought that exist, I've noticed I have a consistent problem with words that don't match concepts in between American political dialogue and non-political dialogue as well. (I don't mean to be US-centric here, but I can only really talk from my perspective as someone who's predominantly experienced things in the US.) Even routine ideas such as class and liberalism and even perhaps dictatorship take on whole different meanings when referred to by communists then when non-communists refer to them, in my experience. I'd taken to describing this as the same word meaning different things, which while accurate doesn't express the idea as elegantly as the words being tied to wholly different concepts does. Yeah, I've always found it interesting how names can be used differently from the way they are understood conceptually. Obviously philosophers have language have made a big deal about this, and some have fetishized to the extent of believing that there can be no meaning, but I just feel it is an invitation to be clear about our concepts. Sometimes the shared names do shed light on a concept, and we might even be able to use the etymological identity connection to make a concept clearer (this actually can be done with "liberalism" in the US context because Democrats are "liberals" and often the US imagination cannot think anymore of anything more left than liberal), but the danger of devolving into some etymological idealism is a problem. Re: powerpoint--try using a black background with white words. It looks like just the words are being projected, which is easier on the eyes and looks kind of cool. That's my very important contribution! Reflections on "Maoism or Trotskyism"